Fresh greens and veggies combined with German pantry staples create salads which are satisfying and nutritious enough to make a great light lunch or dinner. Our fresh interpretations breathe new life into beloved classics like potato and kraut salad. This collection will provide inspiration on how to build a great recipe around a package of German Spätzle noodles or how to incorporate genuine German cheeses and hams to create spectacular salads. Using authentic condiments from Germany, such as vinegars and mustards will add that special note and make your salad truly come together. A salad of watercress, beets, soft-ripened German cheese and a light walnut oil vinaigrette. Perfect with a thin sandwich of hearty German bread and Black Forest ham. Named after a busy working mother from Bavaria, this fresh interpretation of the iconic potato salad surprises with light flavors and bright colors. This delicious salad is a slightly adapted version of a recipe by German Master Chef Marcel Biró. It combines field greens (the original recipe calls for mache) with smoked eel, creme fraiche, cherry tomatoes, and a bacon mustard vinaigrette. A colorful salad for the buffet table to be served as a side salad for sliced cold meats or as a vegetarian meal. 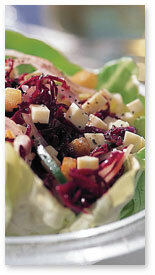 Peppery radicchio combines with German peppered brie cheese in this colorful salad dressed with a wine white German mustard honey dressing. Pure purple power, this salad is chock full of flavor and nutrients. Premium preserved and pickled vegetables make this impressive salad a breeze to prepare. A German East-West dish that’s great as a side or salad entree. Tasty as leftovers, too. Recipe courtesy of Jackie Newgent. Browned prosciutto and garlic flavor the vinaigrette that warms the greens and Roquefort blue cheese in this salad adapted from a dish served at Szmania’s Restaurant in Seattle.